Dr. Anthony J. Onofreo founded Middlesex Dental Associates in 1990. In 1993, Dr. Pamela A. Moore, a Periodontist, joined the practice. 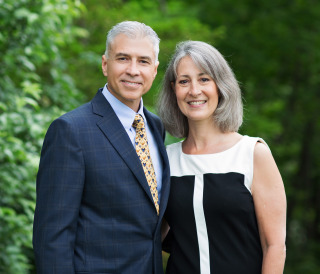 Dr. Onofreo received his Bachelors of Science degree in biology from Boston College before going on to earn his Doctor of Dental Medicine degree from the University of Connecticut School of Dental Medicine. In 1990, Dr. Onofreo began his own practice of restorative dentistry in Middletown, CT.
Dr. Moore joined the practice in 1993. She received her Bachelors of Science degree from Temple University and also earned her Doctor of Dental Medicine degree from the University of Connecticut School of Dental Medicine, where the two met. Following dental school, Dr. Moore remained at UCONN to earn her Certificate in the specialty of Periodontics. Together, this husband and wife team provide a multidisciplinary approach to comprehensive clinical dentistry.